Second Opinion Physician, David Epstein, D.O., is trained in the Walsh Protocol, developed by Dr. William J. Walsh, PhD, and committed to the natural treatment of depression, as well as other mood and behavioral disorders, thru the use of Nutrient Therapy. It is estimated that 13.1 to 14.2 million American adults suffer from depression currently and that at least 32 million will similarly face this disease at some point in their lives. However, the disease can be tricky to tackle for a number of reasons, not least of which are the grave misconceptions regarding depression which are upheld by mainstream psychiatry. Mainstream psychiatry typically regards depression as a “single entity with variations along a central theme”, according to Dr. Walsh. It is also mostly assumed that those suffering from depression have low activity in the receptors in their brains responsible for the handling of serotonin, a monoamine neurotransmitter associated with feelings of “happiness and well-being”. It is this central belief which informs most decisions as far as the majority of medications being used to treat depressive patients. Most are prescribed SSRI medications which inhibit the reabsorption of serotonin into its originating receptor, thereby leaving more of the serotonin free to bind to postsynaptic receptors and to have positive effects, allegedly, on the entire organism. However, after having evaluated 2,800 patients diagnosed with clinical depression, thru the lens of nutrient therapy, Dr. William Walsh is turning both of these centrally held misconceptions about depression and its treatment on their heads. By way of his evaluation and ongoing database studies, Dr. Walsh and his colleagues have identified five high-incidence depression biotypes. 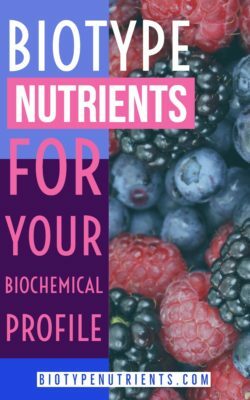 These biotypes reference distinct and unique neurotransmitter & nutrient imbalances and symptoms, and therefore, according to Walsh, should be approached as 5 different disorders. Additionally, he has made links between certain biotypes and the ineffectiveness of SSRI medications, even identifying some subgroups for whom SSRIs are actually dangerous. The biotype studies have given us great insight into these different depressive disorders, as well as a more workable look into what causes depression. Using this new revolutionary approach, Second Opinion Physician is able to direct patients towards lab tests which can identify the very nutrient & neurotransmitter imbalances triggering their particular depression, and can then provide recommendations for natural, highly effective, and individualized treatments. This treatment will most often fall within the spectrum of about 6-8 different natural #supplements, along with dosage recommendations specific to the individual’s other biochemical status. A brief breakdown of each of the 5 Biotypes of Depression can be found below. 95% of the patients in this subgroup are female. Overly high copper levels can result in elevated norepinephrine and reduced dopamine in patients, high-anxiety and a tendency for panic, a high incidence of postpartum depression, estrogen intolerance, tinnitus, and extremely sensitive skin. These persons are typically experiencing oxidative stress throughout their body as they have a limited ability to manage free radicals, such as heavy metals. Working to lower copper levels would be the nutrient therapy approach, but caution must be taken to not lower levels too quickly as it will temporarily worsen effects (due to copper leaving tissue and dumping into the blood or digestive tract). Recommended supplements may include zinc, molybdenum, manganese and chromium (trace elements) and metalothionine producing amino acids. SSRIs are generally reported as ineffective for those suffering from High-Copper Depression. These individuals have an excessive metal burden, such as lead toxicity. They often exhibit severe oxidative stress, unrelenting depression, abdominal stress, a metallic taste in the mouth and bad breath, high levels of irritability or anger, and food sensitivities. A gradual detox regimen might include supplements such as ALA, trace elements, metalothionine amino acids and antioxidants. SSRIs are generally reported as ineffective for the Toxic Metal subgroup of patients struggling with depression. This is a simple summary followed by video of Dr Walsh explaining this in detail at the American Nutrition Association in 2014. Any one person will have variable combinations so the treatment must be individualized. I don’t recommend anyone trying to treat themselves based on this information unless a lab test is performed and a trained practitioner is coaching the individual. There is usually about 6-8 different supplements and dosages recommended for the five biotypes of depression, but it works something like this. This entry was posted in 5 Biotypes of Depression and tagged Copper Overload, depression, Epigenetics, Folic Acid, kryptopyrroles, Methylation, Overmethylation, Pyrrole Disorder, Undermethylation, William Walsh PhD.